Evelyn Marie Simpson died peacefully on Feb. 26, 2019, at Windemere Nursing & Rehabilitation Center. 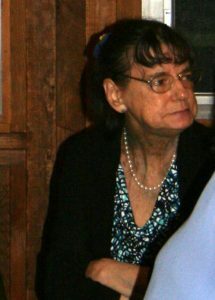 Evelyn was born in Tisbury on Jan. 28, 1944, to Fannie and Manuel C. Sylvia. She worked as a housekeeper for many years at the Martha’s Vineyard Hospital, and at local hotels as well. She enjoyed knitting and hosting a weekly knitting group at her house. She liked to go out to dinner and attend the dock dances at the Edgartown wharf. Evelyn was predeceased by her husband, Ellsworth W. Simpson Jr. She leaves behind her siblings, Agnes Bryant of Oak Bluffs, Manuel C. Sylvia Jr. and his wife Janice of Aquinnah, and Diane Jackson of Edgartown. Evelyn was a mother to none, but like a surrogate mother to her numerous nieces and nephews. She was very proud to be called a great-great aunt. There will be a graveside service at the Oak Grove Cemetery, 299 State Rd., Vineyard Haven, at 11 am on Saturday, March 30. Chapman, Cole & Gleason are handling the service. Memorial donations may be made to a charity of one’s own choice. For online guestbook and directions, please visit ccgfuneralhome.com. The post Evelyn Marie Simpson appeared first on The Martha’s Vineyard Times.